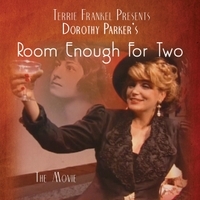 Dorothy Parker's Room Enough For Two - The Movie is written and performed by award winning songwriter, Terrie Frankel, who is also a New York Times best selling author of "You'll Never Make Love In This Town Again" (over 450,000 copies sold). Terrie served on the Board of Directors of the Producers Guild of America, served with the USO and was an early Doublemint Twin along with her identical twin sister, Jennie, who also contributed to the songs in this production. Jennie wrote theme songs for ABC, CBS, NBC and FOX and was an Emmy Judge. Helen Reddy, singer and social advocate, best sums up the talents of Terrie and Jennie by writing, "Terrie Frankel is one of the most underrated songwriters in the USA and I have loved her work for many years. Together with her late twin, Jennie, they wrote many wonderful songs as well as book and lyrics for several productions."